I found myself not far from the National Cathedral again on Thursday, the day after I had been shooting there on a ticketed early morning Photography Tour (see the post here). And unlike the previous day, the sun was out and it was mid-afternoon. The nave was still without chairs and I had my camera with me. So why not? 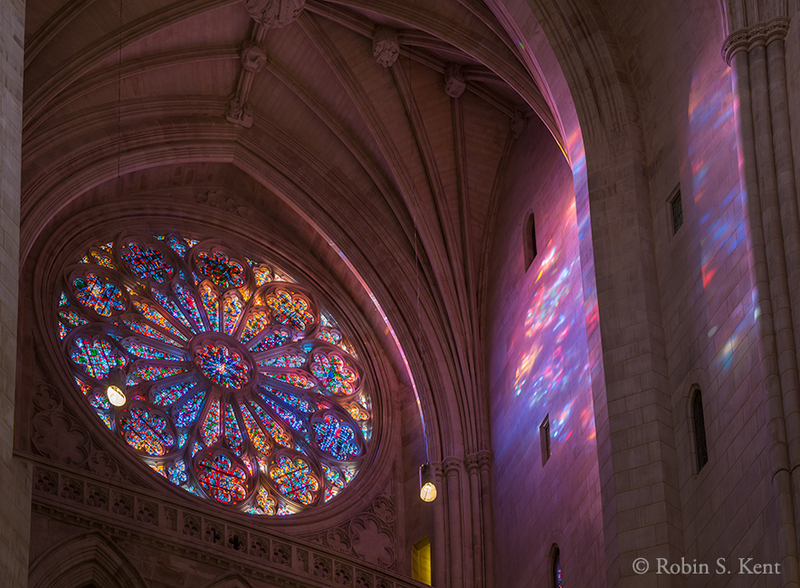 My main goal was to get an image of the Rose Window with the light passing through, as if “painting” the walls. While I was setting up, the Cathedral Choir began a rehearsal for an upcoming performance and the music, perfectly selected for the classic acoustics of a great cathedral space, filled the nave as I worked. Only a few others were there. It was as close to a perfect situation as any photographer could want. This entry was posted in Washington DC and tagged Architecture, National Cathedral, Photography, travel, Washington DC, what to see, Where to Go by Robin S. Kent. Bookmark the permalink. Absolutely gorgeous, breathtaking … heavenly, Robin! What an amazing opportunity. Thanks, Stacy. Yes, if you are going to be shooting indoors, it doesn’t get much better than this. The play of light! Verra cool. Thank you very much. I appreciate your thoughts. These are lovely, Robin. I particularly like the South Side archway – glorious! Thanks, Joan. Good to hear from you. I was also pleased with that one. Painting with light? You nailed it! Gorgeous! Thank you, I really appreciate your comment. Thanks for visiting. Thanks very much, Laura. Yes, stained glass windows can be tough. I usually check for “blinkies” on the LCD display on the back of the camera to make sure they aren’t blown out. But then, as you already know, one has to worry about the darker areas being too dark. This time, however, the amount of light wasn’t overpowering so things worked out. Yes it is underexposure of the darker areas that is my more common problem. It can be corrected a bit with editing and that saves some photos but I keep trying to get it right in camera. Beautiful, amazing light and colours, great opportunity! Thanks so much. Yes, everything seemed to fall into place. It’s great when that happens. I love how the light reflects differently in each image. They are a fantastic set of photos! Thanks, Laura. I do appreciate that. The light in there can change dramatically from moment to moment. One has to be careful not to get too zoned in on one particular spot. Good pointer…I was always told to turn 360 degrees and look at everything. Stunning pictures! The light and colours game sound like music. Thanks! I appreciate your thoughts, thanks for commenting. Very warm colours ! It was the right time of the day, nice ! Thanks very much. Yes, it was a good time. There also are other times when you can expect good (but different) light. 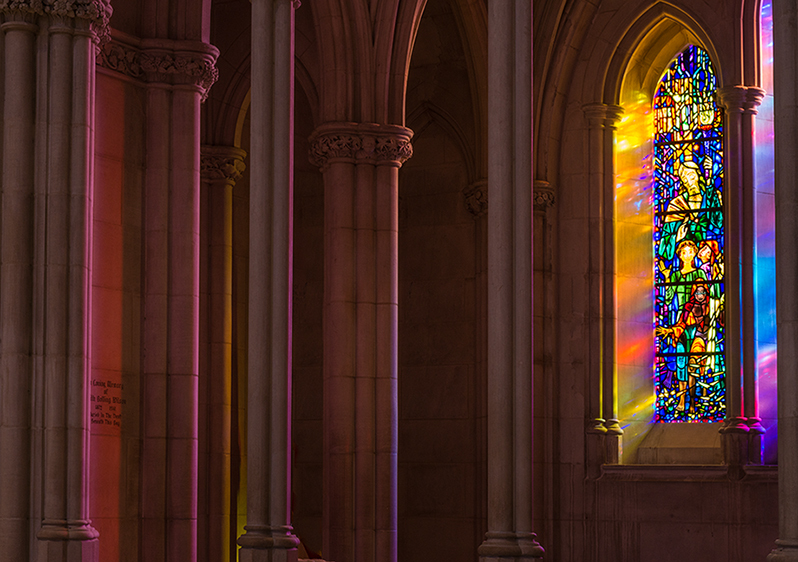 For example, in clear days in late fall, around 10-11 AM, the sun comes streaming through the stained glass windows on the building’s south side and can fill the interior walls of the south archway with a luminous multi-hued glow. In late November through the Christmas season, there is a startling effect known as the “Christmas Angel.” For a few minutes around 11:30 AM the sun directly illuminates a single statue of an angel high on the interior’s back wall. I have the feeling that it requires time to manage to get a perfect shot. You have to study the place, the light. You have to be patient. I’m always impressed by these people that go back to the same spot over and over and managed to get such wonderful images ! Stunning color, Robin! I wish I had been there to participate in that. Thanks, Mitch, Yes, it was pretty cool, having the place all to ourselves for about two hours. And the photographers all took care not to get in each other’s way. I’m pretty sure they plan on continuing this so mark your calendar for next January to check on it.